18a. [-], HELL IF I KNOW. 52a. [-], DON’T ASK ME. 57a. Phrase that defines (and describes) 18-, 24-, 37- and 52-Across], I HAVE NO CLUE. I love this theme! HELL IF I KNOW is my favorite answer in weeks. 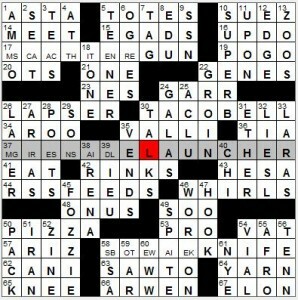 It’s a little meta, with the clue/no clue dealio and the way you may be stumped by a clue. Now, there are five theme answers in Evan’s puzzle, and yet the fill is quite smooth. The five entries account for 47 theme squares, which is a rather ordinary amount and lets the grid breathe. So we get “HEY, YOU,” STONE AGE, GET EVEN, POKEMON, SUNSPOTS, and ERSATZ brightening up the long answers, and GCHAT (that’s Google’s chat app, which I access on the Gmail page), ROGET, JUNK and OOZE adding a little oomph in the short range. It’s not all awesomeness, though. I raised an eyebrow at 46a. [Flying machines, quaintly], AEROS, which felt unfamiliar, and ARETE, a 53d. [Glacial ridge], falls into my crosswordese category. I do like OTO, 12d. [Ear-related prefix], because back in another era I was the managing editor for a book series we called “Oto” for short (Advances in Otolaryngology–Head and Neck Surgery, to be specific); ah, memories. I reckon some of you are crying foul at the inclusion of both OTO and OTOE, 45a. [Siouan tribesman], given that sometimes OTO gets an Otoe clue. 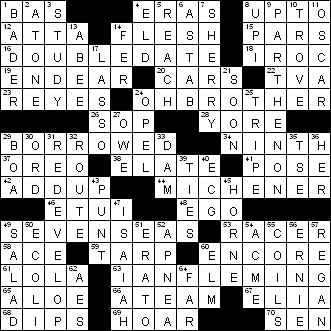 I don’t see it as a dupe, but OTOE appears far too often in crosswords. Too much Otoe, not enough Ojibwa and Lenape and Cherokee, you know? 4.25 stars. Those theme answers were fun to piece together! [Arab country suffering from an outbreak of poison ivy?] clued ITCHY OMAN – especially if they are in less than 400-count muslin kaftans. The original term “witchy woman” feels pejorative to me–is there a corresponding male equivalent? There is this Eagles hit, though. [Assassin of model Carol?] clued ALT HITMAN – not enjoying the reference to assassins here; I wonder if it could have been alternatively clued as “Indie site for assassins,” which still keeps the assassins, but doesn’t pick out a victim. Be kind of interesting to see what chats might go on at that alternative site. Anyway, transcendentalist Walt Whitman was the base phrase here. Nice tie-in to the actual movie with [Phoning a “phone home” character?] or RINGING ET – not sure offhand how to stylize ET, is it E.T.? Anyway, the base phrase here was “wringing wet,” which makes me think of facecloths or dogs-just-out-of-ponds. Is my hair the color of wisteria? I like to think it more resembles a fuchsia gladiolus. Three times you must do what the title says, choosing between two weapons: MACHINE or SCATTER GUN, MISSILE or GRENADE LAUNCHER, and BOWIE or STEAK KNIFE. Guess if I were on the receiving end I’d go with scatter, grenade and steak, but all six are pretty menacing. Your choices are presented through semi-Schrodinger squares, clued doubly instead of once as in a true Schrodinger. But even with the double clues it still took some fancy stepping to get everything to fit. Good fill: RSS FEEDS, PIZZA and LAGER, the aforementioned TACO BELL, and SUPERB. 18a. [Treat for a solstice party with an image of Gaia drawn in icing? ], PAGAN CAKE. Pancake with Giorgio Armani’s GA inserted. I wasn’t familiar with the Armani initials logo. 28a. [Live video of the 2008 presidential runner-up going about his daily life? ], MCCAIN STREAM. Mainstream + Coco Chanel’s CC. 38a. 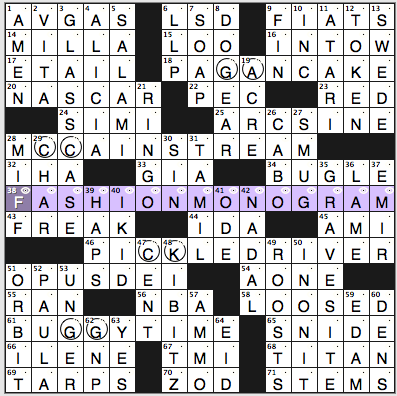 [The pairs of letters inserted into each of this puzzle’s theme answers, for example], FASHION MONOGRAM. 46a. [One at the wheel of a gherkinmobile? ], PICKLE DRIVER. Pile driver + Calvin Klein’s CK. 61a. [“All right, y’all, let’s get in the old-fashioned horse-drawn carriage!”], “BUGGY TIME!” Buy time + Guccio Gucci’s GG. Never knew Gucci’s full name; had assumed it was just a pair of G’s both standing for Gucci. The gherkinmobile and “BUGGY TIME!” bits amused me. 1a. [Fuel for some prop planes], AV GAS. I don’t own a prop plane, if you can believe that. 6d. [Letters for some accounting firms], LLP. Limited liability partnership. 45a. [“What ___ gonna wear to this thing? ], AM I. If by “this thing” you mean the ACPT, then the answer is jeans, corduroys, and assorted sweaters. No couture for me this year; I just wasn’t moved by what I saw on the runways. 51a. [“The Da Vinci Code” group], OPUS DEI. Are they real or fictional or mythical? 56a. [Org. in which “everybody played with a gay teammate,” per Charles Barkley], NBA. See also: NFL, MLB, NHL, MLS, WNBA. Just because someone isn’t out to you doesn’t mean they’re not in the LGBTetc. category. 67a. [“Hey-oh, keep the urologic details to yourself”], TMI. I once edited a paper on male STDs from a urology standpoint. I have an awesome bit of TMI from that paper that I can share by email, but it’s too horrifying to present on the blog. 39d. [“They was watchin ‘Yo! MTV Raps’ / What’s the ___ on the craps?”: Ice Cube], HAPS. A friend of mine uses “What’s the haps?” in conversation so I totally nailed this one. Did not know it was an Ice Cube reference although she probably told me. 52d. [Deen of wince-inducing language], PAULA. Her latest was likening herself to Michael Sam, “the black football player” who came out. I guess Paula felt it was important to distinguish Sam from all the white, Latino, and Asian football players who’ve come out, to prevent confusion in her audience. 3.5 stars. LLP and AVGAS offset the liveliness of things like KIBITZ and NASCAR. Ok, I’m cooking and blogging! Hope my roast chicken doesn’t catch! 16a, [Outing for four], DOUBLEDATE. 24a, [“Don’t tell me!”], OHBROTHER. As with the low density theme, the puzzle is blacker than usual with 3 extra pairs of “helper squares”. Again, I think more people would be irked by poor quality fill than a few more black squares, so for new constructors, this is a good ploy. There a two A- partials (ABEE and ASTAB) and TVA doesn’t resonate with me, but maybe you have to be American to appreciate it! That’s not bad going! and I did appreciate the other literary long answer, MICHENER: I’ve read a good number of his novels! “The Covenant” is surprisingly insightful about South Africa’s history, for instance. This entry was posted in Daily Puzzles and tagged Ben Tausig, Evan Birnholz, John R. O'Brien, Patrick Blindauer, Randall J. Hartman. Bookmark the permalink. 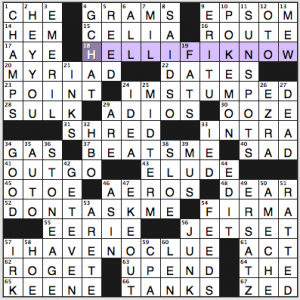 As I went through this NYT crossword, I was disgusted by the disregard for factual accuracy. Based on these errors, it seems quite likely to me that no serious attempt was made to ensure factual accuracy. First off, the KEENE clue is 100% wrong. Carolyn Keene is a made-up name, a pseudonym. This is easily verified by Wikipedia’s “Nancy Drew” article, among others. The sad thing is, you don’t even have to read the whole article – just the FIRST SENTENCE, which undeniably contradicts the clue. To even suggest that a nonexistent person “created” something is downright absurd. Pathetic. But the errors don’t stop there: the description of Pokémon as a “fad” is downright absurd. The franchise has been going strong for about eighteen years now! The trading card game …still going. The television series…still going. Pokémon movies…still being released. And the video game series….well that is breaking record after record for sales, and is one of the most popular video game franchises in the WORLD. The Pokémon Wikipedia article clearly dispels the idea of Pokémon being a “fad” in the intro. Pathetic. The third error I saw is one I am not entirely sure of. But the only place I could find a definition for “noble element” suggested that it was a metal or alloy, not a gas. Needless to say, suggesting that gases are somehow “righteous” or “aristocratic” is downright absurd. Did anyone actually test-solve this puzzle? I don’t entirely disagree with your criticism of the clue for POKEMON — I submitted a different clue for that one anyway — but it’s really hard to take your other criticisms the least bit seriously. Mark Twain was a pseudonym for Samuel Clemens. Are you going to object every time a clue for TWAIN says that he created “The Adventures of Huckleberry Finn”? So in other words, you have no idea if it’s an error, but you’re going to declare it one anyway? This former chemistry major presents you with the concept of noble gases. There are also elements known as “noble metals.” I think about half of the elements called noble are gases and half metals, ergo [Many a noble element] is apt. Sarah, English has a ton of words with multiple meanings. “Noble gas” has a specific meaning that has nothing to do with righteousness or the aristocracy. Similarly, if I say “That Evan is one cool cat,” I am not suggesting that he has long whiskers, a tail, and an affinity for goopy tuna products, nor am I implying that he could use a sweater to ward off the chill. “Similarly, if I say “That Evan is one cool cat,” I am not suggesting that he has long whiskers, a tail, and an affinity for goopy tuna products…” Yeah, but word on the street…. Well, I don’t own every reference book in the world. Maybe one of them has “noble element” defined in this way. Which is why I can’t be sure. Classic mistake, assuming that “noble element” was a noun rather than adjective + noun. That’s why I said I wasn’t sure. Scratch that one off the list. Didn’t George Eliot, George Orwell, Isak Dinesen and many others all write (i.e. create) novels? Didn’t “Houdini” recently appear in a puzzle? You might as well rail against the suggestion that he ever escaped from anything, on the grounds that there was no such person. It was really Mr. Weiss. Personally, I liked the puzzle. Here, the pseudonym KEENE refers to the name seen on the covers and spines of said books. It is 100% common accepted usage to reference a pseudonym as the known author, in a general knowledge puzzle :). See also: Dr. Seuss vs. Theodor Geisel, et many al. No problem with bringing up issues and inconsistencies in puzzles, but here the strongly worded error argument does not hold. As far as Pokémon, its continued existence does not negate referencing the peak of its popularity as a “fad”. The clue is likely accurate based on sales, media exposure, etc. A fad can mostly die out of existence (hello, pogs! ), but it can also be incorporated into the mainstream culture. See also: hula hoops, Cabbage Patch Kids, et a whole lotta al. Guess I have to quibble with Sarah’s observations. The six noble gases are quite familiar to anyone who’s taken any sort of chemistry classes. And while I wouldn’t know Ms. Keene from Adam, that’s every bit as legit as George Orwell or Mark Twain. I can’t fathom the distinction. As for when a fad becomes a movement, I’ll leave that to others to pontificate. I gave this one 4.5 stars; a very refreshing Wednesday. And I’ll quibble your observations too. Noble element does not appear to be a legit term. Noble gas does. I would contest TWAIN for “Finn’s creator” just as much. And since Pokemon is still going, it’s impossible to tell whether it’s a fad or not, since no matter how long you think a fad is, it could in theory continue for that long. Read the clue as [Many a “noble” element] and it works for both METAL and GAS. Aren’t you going to complain that “beret-sporting rebel” is not defined in the dictionary as a phrase, too? To paraphrase today’s puzzle “I haven’t a clue” (and I’m serious, I don’t have a clue), whether the above comments by Sarah are intended to be humorous or not. Putting down crosswords in order to get a laugh just seems incredibly silly. I’m insulted that you even suggested it. I keep forgetting – Is it solve, comment, get drunk, or solve, get drunk, comment? Don’t take Sarah’s criticism too seriously. She hasn’t been the same since someone dropped a house on her sister. I agree. Gasses are the proletariat of elements– their ability to rise over other elements notwithstanding. I was introduced to the concept of noble gases in my 8th grade science class. You know…Helium for example. And I went to public school in a coal mining region. Let’s just move on and pretend this whole conversation never happened. Are we not docking any points for the word “me” being included in two of the theme answers? Specifically at the end of both? I thought that was a no-no. Hey Evan, thanks for the cluing insights you left in the comments section at The Other Crossword Blog. One thing I’ve surmised is that the young bucks who write the indie puzzles have an advantage in that they are in a better position to dress up their bad fill with creative cluing. They are pretty much all digital so there’s no space limit, they’re not worried about pearl-clutching from their audience about rap lyrics and such, so they can really make lemonade out of bad-fill lemons. Your clue for ASIN would have nice, but I see where Will had to change it to the boring option. Sorry I’m late! Have there been any messages for me? Best thread I’ve seen on this site in a long time. Sarah makes a couple of points, which are debatable, but I don’t agree about the fill. This one is pretty solid and I’m sure Evan especially enjoyed getting 18A past the NYT bluebloods. You-all wouldn’t have believed the email I once got for including PAPAL BULL in a puzzle, from the masses who couldn’t consider the possibility that I wasn’t being blasphemous. Or maybe you would. In tribute, I once made a puzzle for Newsday with FREQUENTLY WRONG/BUTNEVERINDOUBT and OVERCONFIDENT in the middle. In the ancient days, the cost of a stamp dissuaded this fact-free crowd. P.S. Whenever I can, I deliberately put “just deserts” in a puzzle just to draw them out. Thanks to all for the extra chuckles today! As for Pokémon: I know a guy who’s about 40 and still loves Pokémon. And while my teenage son never got into it, he absolutely had friends who were a tad obsessed with the Pokémon trading cards game as recently as 2010. It’s a fad with legs, and it still draws faddish obsession in those who get drawn in. But! It began in 1996, and as such is a [Late ’90s fad]. It was also most likely far more popular in the late ’90s than it is now. At one point my son (just turned 20) was seriously into Pokemon and we had every Pokemon card and I think eventually some Pokemon video games. He would only have been five in 1999, so I am pretty sure his involvement did not start until probably 2003 or 2004. We used to have contests with each other as to who could name the most characters. I just looked at the original list and could barely recall any of them. I am pretty sure PIKACHU was one of the most famous. After Pokemon had run its course for my son, he got into Digimon and we collected all those cards. I am hoping that someday all those original cards (we have hundreds if not thousands) become a must have retro fad item. However, I fear that they won’t because the fad and its related video games remain strong, second only to the Mario franchise. I truly wonder if Sarah is a regular who likes to stir the pot. It has indeed been a fun thread. Crosswords were a fad during the 1920s, and I think they’re still around. Fad to me connotes short-term mass popularity, “mass” being the operative word. There are always those whose interest predated the period where it reached the tipping point, and those whose interest remains after its 15 minutes are up. My son (11 years old) just pulled out his shoebox of Pokémon cards and assembled a fire deck, after not seeming to think about his collection for over a year. We finally figured out that the new limits we recently set on screen time spurred his renewed interest. I hope he doesn’t start walking around the house uttering cute cartoony nonsense syllables again. “Bahhh!” “Ooohh!” He always identified more with the Pokémon characters than the trainers. Thanks for the nice review, Matt! 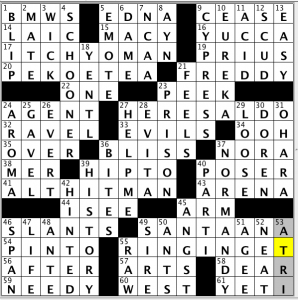 For people who like that sort of thing, there are still slots left for classes at Xword University (my next Puzzlefest, an interconnected set of xwords with a meta-answer and puzzly prizes). Visit http://www.patrickblindauer.com to preregister; the puzzles are done and being tested now so they should be ready in a week or so! 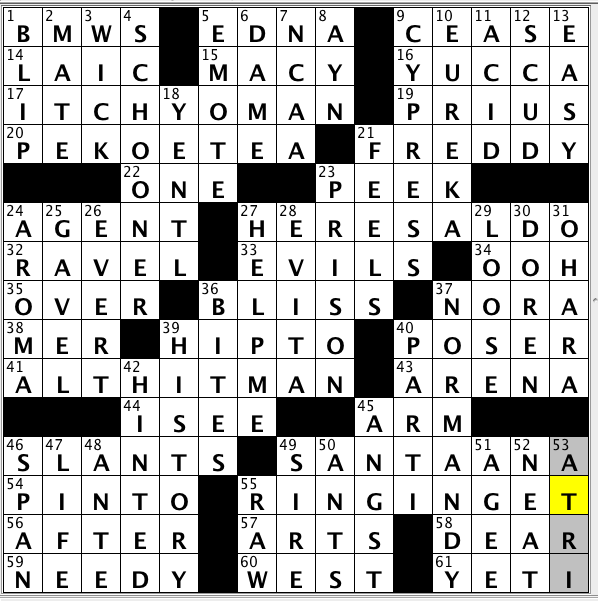 This CPA is insulted by the clue for 59 Down. POKEMON is kind of timely, given the current-ish buzz on the internet around this experiment: http://www.twitch.tv/twitchplayspokemon. I feel like I’ve just seen this puzzle theme recently (LA Times?) but I can’t place where. Still very cleverly done, and lots of impressive long to medium answers! It did seem oddly familiar……..
Sarah’s point about the clue for Keene is actually an old debate. The exact same clue and answer were in the April 9, 2013 puzzle. Fact Boy raised the same objection and, of course, Martin Herbach, the fact checker, replied. FB: “Carolyn Keene” is the pseudonym used by more than a dozen individuals, nearly half of them men, who wrote Nancy Drew mysteries for hire for the Stratemeyer publishing company. Under copyright law, the creator of a work written for hire — hence the copyright owner — is the entity doing the hiring. In this case, that would be Stratemeyer. Carolyn Keene never existed. Martin: I sense that FB is asserting the clue is “wrong.” If so, I don’t agree. We readily accept pseudonyms: nobody objects to pretending Mark Twain and Lewis Carroll are real names. If we want to be pedantic and say the first “Carolyn Keene” was the bearer of the pseudonym who “created” Nancy Drew (her name was Mildred Wirt), it still works for me. The bottom line is that everyone involved in the production of the puzzle knows that Carolyn Keene never existed; Fact Boy seems to be unaware of that fact. I chimed in: I think we should all conduct ourselves in a civil manner. I doubt FB will respond to Martin because he almost never does. So I will merely add to the discussion. Martin, I do not believe you responded to FB’s point. Mark Twain and Lewis Carroll were real authors who wrote under pen names. They were the creators of their works. There was no single individual who wrote under the name of Carolyn Keene. Hence Carolyn Keene cannot be said to have created Nancy Drew. The publishing house was the creator and hence the use of the word “creator” in the clue was at least unartful, if not inaccurate. I would characterize that as a fine point, not pedantic. The clue might have been better served if the word author was used instead, only because that was the name identified as the author, regardless of who the author really was. Let me quickly add that Nancy Drew was never in my personal library so I have no clue about Carolyn Keene. I was a big fan, however, of Mr. Keen, Tracer of Lost Persons. That Mr. Keen was one of the longest running radio programs and he was portrayed by three different actors over time. So who created Mr. Keen? Obviously, neither FB nor I persuaded Will and I doubt Sarah will either. But, to paraphrase my favorite President, I could be wrong. My apologies for the length of this comment…. I am sorry to come here so late as I do have a legitimate problem with a clue and answer, but by this morning I had completely forgotten the puzzle. The clue for 6D reads “What a gimel means on a dreidel.” The answer reads ALL. I am definitely not a Hebrew speaker or expert but “gadol” is the word represented by the gimel, and it does not mean ALL but GREAT. Wikipedia actually does a good job of explaining the letters on the dreidel and what they stand for. As for all the other errors alleged, I would say “stuff and nonsense,” except I can’t remember whom I stole that expression from. If you roll a gimel, you get to take ALL of the pot. Well, what did I know? But then the clue is misleading, because it asks what the “gimel” means, not what rolling the “gimel” means. Is this general knowledge? I would say it’s specific knowledge. I think most everyone probably got the ALL through crossings, or am I wrong? I guess I didn’t read far enough in Wikipedia.